approximately 45"/114cm long by 25"/63.5cm in depth. Nanodistal is a reversible beauty, ideal for hot days when you’d still like to wear something chic. Wrap Nanodistal like a cowl by tucking its long ends around your neck or leave them hanging down for ornamentation instead. This makes great use of a lace weight hand-painted yarn and linen in particular offers gorgeous drape when knitted on larger needles. 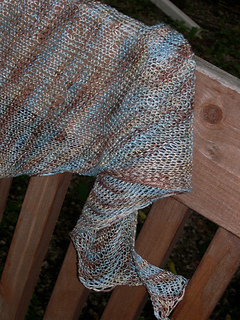 Nanodistal is Distal’s cousin, using a similar concept to produce a slightly differently sized shawl. This asymmetrical shape is a quick knit, requiring only simple stockinette knitting, yarn overs, decreasing, and other basic skills. Use your crochet skills for an optional single crochet edging or add your own knit one as a finishing touch. Nanodistal is flexible: adjust the yarn type and weight and gauge by choosing a needle two sizes larger than called for on the yarn’s ball band and create a design all your own. 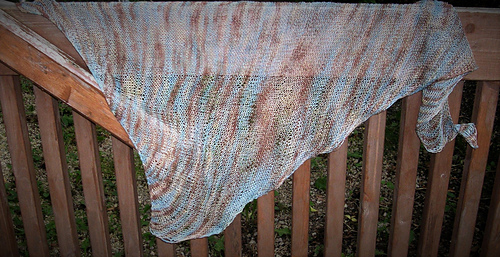 Using one skein of laceweight yarn and size 6(4mm) needles, the shawl measures approximately 45”/114cm long by 25”/63.5cm in depth. An asymmetric, slightly curved triangular shape, measuring approximately 45”/114cm long by by 25”/63.5cm in depth. This pattern is stretchy, so blocked measurements will vary. Length and width of scarf will vary according to your yarn choice, needle size and blocking approach. Note: This shawl pattern is easily adjustable should you choose to use more or less yarn, simply increase to more than 95 sts or less according to your yardage. 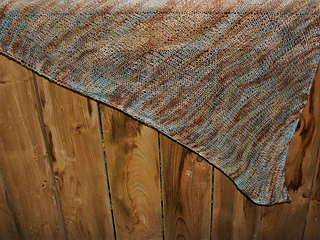 • Use more yards of any weight yarn for a longer/wider shawl. • Use more yards of a lighter weight yarn for roughly the same size as the sample. 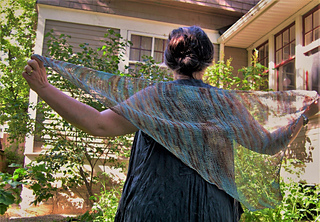 • If using a heavier yarn, choose a bigger needle size in order to maintain the open nature of the shawl. 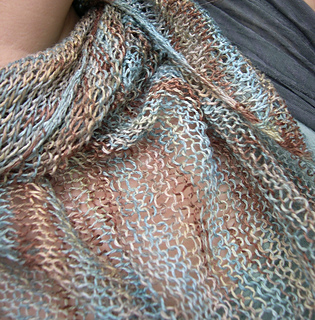 • If you’d like a warmer shawl, create a more dense fabric by choosing a needle size closer to the manufacturer’s suggestion on the ballband. Note: This information is for reference only. Please substitute whatever is in your stash or suits your fancy! Linen or silk will create more drape; wool will have more elasticity. 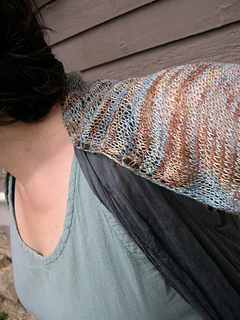 Note: This gauge is approximate; a natural fiber shawl can be blocked to a larger or smaller gauge depending on the individual knitter. 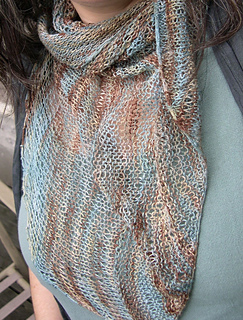 It’s not necessary to calculate gauge to knit this design; if you like how it looks, keep knitting!